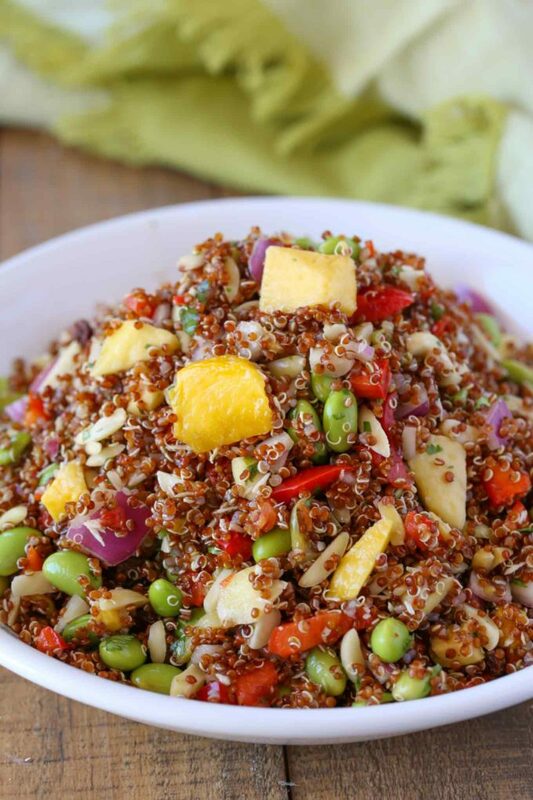 Tropical Quinoa Salad Recipe made with pineapple, mango, edamame and almonds tossed in a honey lime vinaigrette. 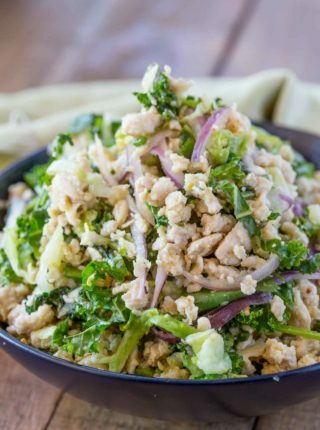 An easy, healthy, summer salad made that’s perfect for lunch like our favorite Rainbow Thai Chicken Peanut Salad and Mango Curry Chicken Salad it’ll liven up your lunchbox. Quinoa is a high point, but incredibly important part of our daily meals. We love it so much it’s almost completely replaced rice in our diets for everything except Chinese food recipes. I can’t help it, we love rice with takeout. The majority of the fats in this recipe come from the quinoa and olive oil, which are both important parts of a healthy diet. We all try to minimize our points for each recipe, but healthy fats are still an important part of our diets. 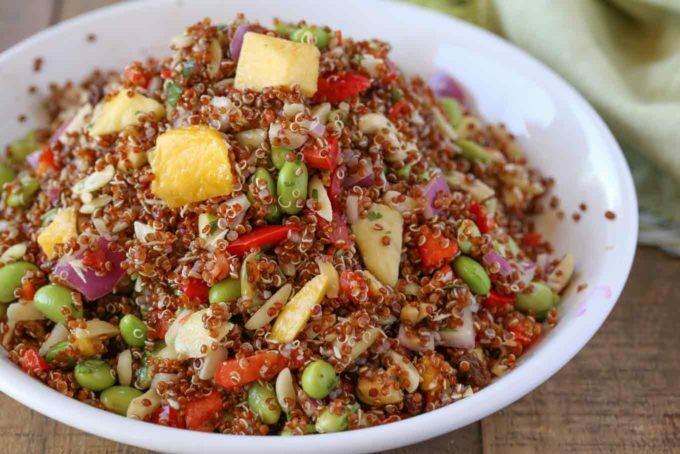 With 1 teaspoon of olive oil per serving, quinoa and almonds, you’ll feel full and happy after enjoying this salad. This honey lime vinaigrette is a dressing I use on a ton of different salads we enjoy. 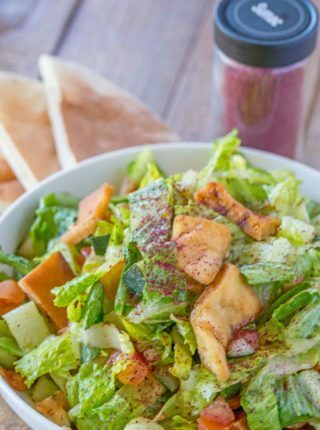 The flavors of the honey, citrus and mint work so well together it tastes like a restaurant quality dressing. If you have grilled chicken or salmon, this vinaigrette poured over it with a bowl of greens is an easy lunch or dinner option too. Don’t swap out another sugar for the honey, the distinct honey flavors here work well with the other ingredients adding a great depth of flavor. 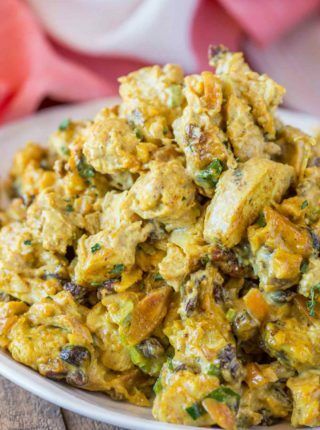 This recipe is perfect for meal prep, the only thing I would add last minute is the slivered almonds so they don’t lose their crunch, but with hearty vegetables in the salad you can make this on Sunday and enjoy it all week long. When making meal prep salads you want to be sure you aren’t using ingredients that will wilt or won’t hold up well in a refrigerator. Tomatoes for example will get mealy and unpleasant after being in the refrigerator, so we use bell peppers in this recipe. Lettuce will wilt within an hour after being dressed so we omit it here, but if you’d like to include lettuce in this salad you can when serving. We love to sometimes add lettuce to recipes it isn’t called for to bulk up the recipes. Often, just feeling like you’ve had enough of a serving is the biggest battle with trying to keep on target with your points. 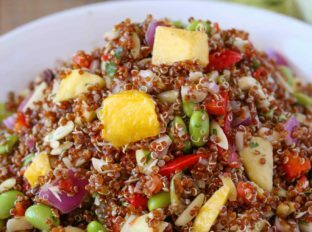 Tropical Quinoa Salad Recipe made with pineapple, mango, edamame and almonds toss in a honey lime vinaigrette. Rinse the quinoa really well to remove the bitter coating. Add the quinoa to the pot with water and bring it to a boil. Reduce the heat to medium-low and cook, covered, for 15-18 minutes. Remove from the pan into a large bowl and spread apart to help it cool faster. Add the dressing ingredients together and whisk until combined. Add the rest of the salad ingredients to the cooled quinoa and toss. Add the dressing evenly over the salad and toss before serving. I love trying new recipes with quinoa! 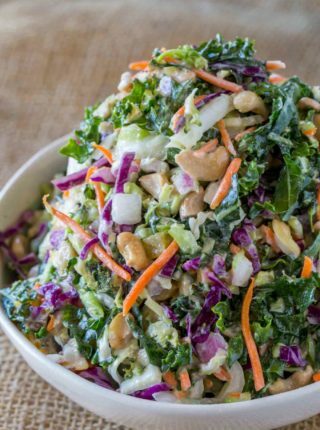 This looks so good and that dressing does too! I don’t care for quinoa in any form (texture!! ), so I made this as a salad tossed with romaine and spinach. WINNER!!!! I love a quinoa salad with tons of fun stuff in it. Totally making this soon! I love your flavors! Make me dream of the beach eating this! 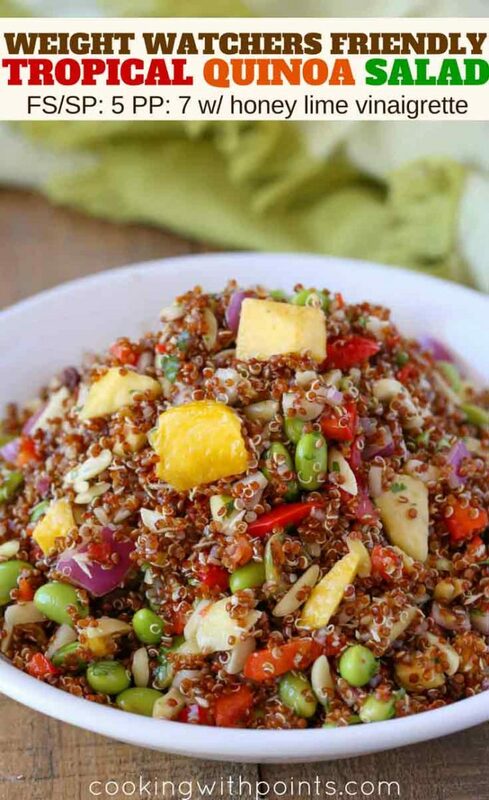 This is such a great way to eat quinoa! I am loving this quinoa salad. Perfect for summer time. I make this salad all the time, minus the edamame, and I LOVE it. Thanks for the recipe! So glad you love the recipe, Chrissie!